The importance of employability comes through clearly in international student surveys. Simply put, a clear majority of students cite employment outcomes – the chance for new career opportunities or for advancement in their current career path – as their primary motivation for study abroad. In a similar vein, more targeted research has also revealed that students give the greatest weight to employment factors when choosing an institution abroad, far ahead of academic or research reputation of the institution in many cases. The question that naturally follows from this insight is, “Which universities provide the best employment outcomes for their graduates?” And this is the inquiry taken up by two recently released rankings, one commissioned by the French human resource consultancy Emerging and another from QS. The Emerging study was carried out by Trendence, a German research firm, and it relies on two survey panels conducted between April and July of this year. Both panels drew responses from 20 countries: Australia, Brazil, Canada, China, France, Germany, India, Italy, Japan, Malaysia, Mexico, the Netherlands, Russia, South Korea, Spain, Switzerland, Turkey, the United Arab Emirates, the UK, and the US. The first panel focused on 2,500 senior recruiters, each of whom was asked to cast up to 15 votes for the “universities in [their] country [that] produce the best graduates in terms of employability”. A second panel of 3,450 managing directors of large international companies produced a further round of voting for both local and foreign institutions. Trendence then compiled both rounds of voting into a score for each university. The resulting ranking of the top-rated 150 global universities for employability has been published exclusively by Times Higher Education since 2015. The actual rankings are not terribly surprising, with the top end of the table a veritable “who’s who” of elite educational brands – almost entirely from the US and the UK – where ranking for employability correlates closely with overall university rankings. Beyond the top ten, the list broadens out to include a wider field of countries and institutions. Mr Woon’s comment points to a question at the heart of the survey: what is employability, really, and what are the factors that contribute to greater employability for university graduates? Respondents to the survey largely defined employability as a “set of job-related aptitudes, attitudes, and behaviour” and, more broadly, as the readiness of graduates to immediately undertake entry-level positions in their chosen fields. When asked to rate a series of employability skills on a four-point scale, survey respondents gave the greatest weight to the following traits: communication skills, motivation, adaptability, ability to work in a team, and flexibility. These key skill areas, along with the more traditional emphasis on academic achievement and technical skills, are an increasing area of focus for many institutions. And a growing number of universities are looking to closer collaboration with employers to further foster some of these high-demand traits in their graduates. Where the Emerging/Trendence survey is notable for its insights on employer perspectives, a second ranking – the QS Graduate Employability Rankings 2017 – takes a broader view altogether. It applies a weighted average of five ranking factors, including employer reputation, alumni outcomes, employer partnerships, employer-student connections, and graduate employment rate. The significance and relevance of these factors is nicely reinforced via the Emerging/Trendence findings, and QS has used them to produce a ranking of 300 institutions with some marked differences from the Emerging table. 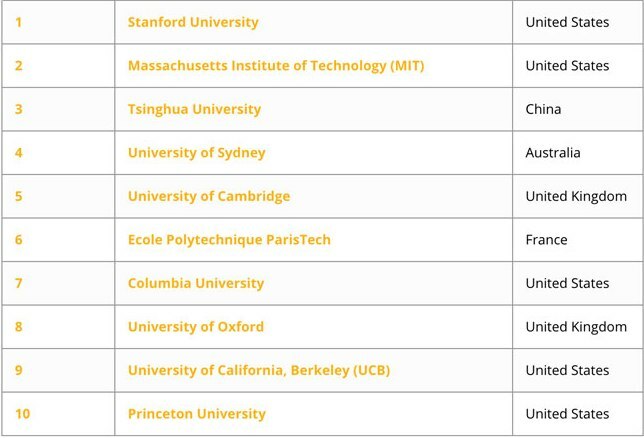 As the following chart reflects, while American and British universities still have a prominent place at the top of the QS table, we also see strong placements for Chinese, French, and Australian institutions. The other notable thing across much of the QS ranking is the prominence of institutions with a strong emphasis on STEM fields (science, technology, engineering, and math). Taken together, both the Emerging and QS rankings reveal some important insights for institutions of all stripes, including the importance of so-called “soft skills”, such as communications skills and adaptability, and the growing utility of expanded linkages between institutions and employers. The findings also illustrate some of the useful employability factors that institutions can track and promote. Particularly for those institutions outside of the top tiers of international ranking tables, any such alternate measures of graduate outcomes can represent powerful signals for prospective students. This entry was posted in Higher Education, Most Popular, Research and tagged employability, university ranking, university rankings, postgraduate student recruitment, colleges with international students.